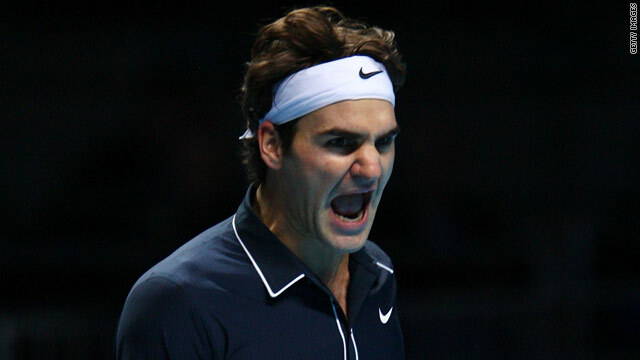 Roger Federer was taken to two successive tie-breaks before edging past Frenchman Florent Serra. (CNN) -- Roger Federer is through to the Sony Ericsson Open fourth round in Miami, after beating Frenchman Florent Serra in two tough tie-breaks. The top seeded-Swiss took just over an hour-and-a-half to set up a clash with Czech Tomas Berdych -- dropping his serve three times in a disjointed performance. "Sure, I still have to tidy up my game a bit, having had one break up in the first and two breaks up in the second; it's normally something that doesn't get away from me," Federer told the official ATP Tour Web site. "But the most important [thing] is to come through the rounds, so I don't have a preference how it's done. It's nice to having won two breakers, because that doesn't happen every match you play." Berdych, the 16th seed, beat Argentine Horacio Zeballos 6-4 7-5 to secure his place in the next round, while fifth seed Robin Soderling of Sweden was more impressive in a 6-1 6-2 hammering of Germany's Philipp Petzschner. Seventh seed Marin Cilic edged out Marcos Baghdatis 6-3 6-4 while Mardy Fish -- who knocked out holder Andy Murray -- continued his fine form with a 7-5 6-3 win over Feliciano Lopez. It's nice to having won two breakers, because that doesn't happen every match you play. Meanwhile, in the women's tournament, top seed Svetlana Kuznetsova suffered a shock defeat at the hands of France's Marion Bartoli, losing in straight sets in under an hour. Bartoli eased into the fourth round with a 6-3 6-0 victory, as Kuznetsova needed three bouts of physiotherapy on a shoulder injury. Russian Kuznetsova told the official WTA Web site: "I suffered the injury in my first match, but it has grown steadily worse. "I almost had stars in my eyes it was so painful. I called the physio and tried to continue playing but I think I should have pulled out earlier," added Kuznetsova. Meanwhile, third seed Venus Williams recovered from a dismal opening set to beat Daniela Hantuchova 1-6 7-5 6-4. The American dropped eight of the first nine games before rallying at 2-0 down in the second set and next faces sixth seed Agnieszka Radwanska of Poland. Second seed Caroline Wozniacki will face wild card Justine Henin in the last eight after the Belgian beat 11th-seeded Russian Vera Zvonareva 6-1 6-4. Henin's compatriot Kim Clijsters crushed defending champion and fourth seed Victoria Azarenka 6-4 6-0 and faces Samantha Stosur -- after the Australian ended Jelena Jankovic's hopes.